It was such a pleasure to have Pudsey to stay last weekend. We picked him up from Southampton on Friday evening and head straigh to Bournemouth Station where Pudsey got a tour of the Cross Country train before it headed back to birmingham. He was able to look in the cab and enjoyed sitting at a table with Ellie, lauren and Daniel who attend FitKid. On Saturday he came with us to Bournemouth and met many of his fans and joined in a FitKid workout. It was lots of fun and great to have Pudsey with us for the weekend. On sunday we returned Pudsey to Southampton and my daughters were very sad to say Bye Bye to him. However we are off to seeiung him on Friday to hand over our fundraising. A great fun wekend for all and a great opportuntity to raise funds for a very worth while cause. I’m so excited, it’s nearly time to say hello to Pudsey again, oh yes the FitKid team are ready for all the fundraising efforts and we are looking forward to helping Pudsey raise lots of money for a fantastic cause. Look out for more developments about what the FitKid team along with Pudsey will be doing to raise funds. Yes, we helped raise yet another £250 for Children in Need! We have now officially lost count. Isn’t it great? The numbers keep on coming in for our LazyTown Sports Club, “Learn a SuperHero Move” for Children in Need charitable initiative. Yes, we have another £250 confirmed by Children in Need from the buckets we took around the Poole and Bournemouth Area recently. As per the headline, we have now officially lost count of the total, which may not appear that professional, but who cares. It is more money for a fantastic cause. In fact, many causes. We are now looking to connect with other charities in 2011, along with Children in Need. So, if you are a children’s charity and want to contact us to potentially engage the FitKid team which powers the LazyTown Sports Club concept, why not drop us a line with your ideas. Also, just think how much we could get with more franchisees on the ground. Do you want to join our growing team? If you do, click the photo for more information. During the course of the last week, we all at FitKid had moments of reflection during our LazyTown Sports Club, “Learn a SuperHero Move” for Children in Need initiative. There is nothing better in life than seeing happy children, enjoying themselves whilst getting active as the headline of this post says. However, what makes this extra special is the fact that these children were being educated about why they were doing it and that is was helping others. We all have moments of reflection in life and the whole project has given us a real buzz which we have seen brighten up many children’s faces. Being able to integrate the full Pudsey, Sportacus, Stephanie, and the LazyTown Sports Club experience to this in an active way has been hugely energizing. I would urge anyone who has never fully engaged in a real Children in Need initiative to do it next year. The feeling of helping others whilst being active with kids and their carers has been immense and we look forward to doing more for the charity in the future. ….That includes the elderly Gentleman in the Dolphin Shopping Centre in Poole. 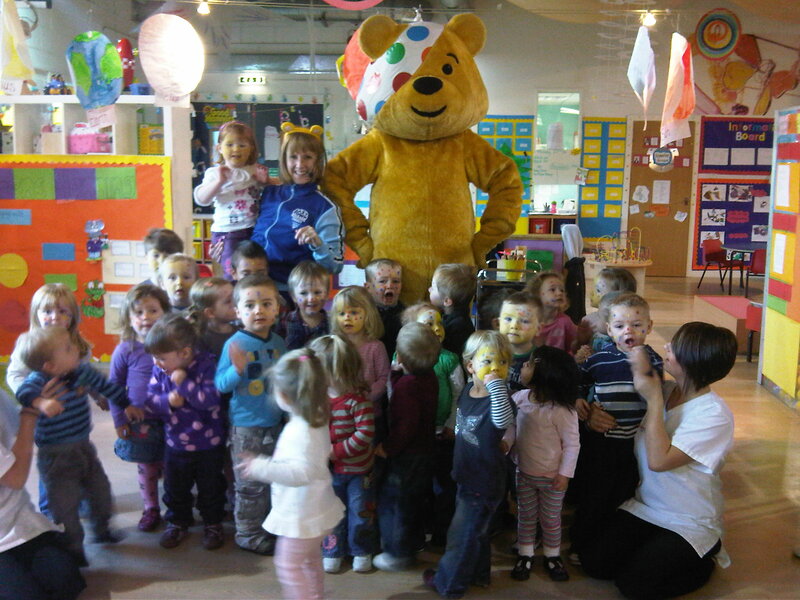 Pudsey, Sportacus, and Stephanie are very proud of all of you who joined in and contributed. as am I and the whole FitKid and LazyTown Sports Club Team. If you want to have the LazyTown experience in your school, please contact Mandy for more details.